Against the background of Petersburg's austere architecture the oriental building crowned with a turquoise-blue cupola and accented by two elegant minarets stands out. It is the Mosque that is nowadays the only functioning Muslim temple in the city. The Mosque was founded shortly before the World War I, in 1910, and was meant to commemorate the 25-th anniversary of the rule of Abdul Ahat Khan, Emir of Bukhara (Turkistan). 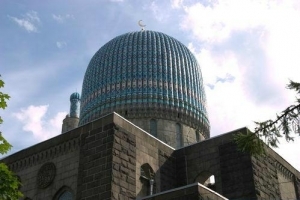 The Muslim community, one of the largest religious communities of Saint Petersburg, asked the authorities the permission to build a temple since 1880, but the permission was given only on 1906. The place for the future building was chosen close to the Peter and Paul Fortress. Although there were many opponents of the construction of the Moslem Mosque in the very center of Saint Petersburg, in 1907 Nicholas II authorized the sale of land. The announced architectural contest was won by architects Krichinsky, Vasiliev and Gogen. The project of Petersburg's Mosque was inspired by the most famous monuments of Central Asian Muslim architecture. Thus, the cupola of the Mosque greatly reminds of the 15th century Gur Emir Mausoleum of Samarqand. The walls were faced with dark-grey granite that attaches monumentality to the construction and makes the building look more natural in the austere architectural ensemble of the Northern Capital. The dome and two minarets of the mosque were decorated with multi-colored tiles and the facade was adorned with sayings from the Koran. The traditions of Muslim architecture were strictly followed not only in the exterior but also in the interior decor. The columns supporting the arches under the dome were faced with green marble. In the center of the hall hangs a giant chandelier, covered with sayings from Koran. The semi-spherical niche in the wall, calling the mihrab, is faced with blue ceramics. The mihrab's location is oriented to the sacred Moslem city of Mecca. According to Islam regulation there is no depiction of living creatures, but a plenty of ornamental patterns lavishly covering the walls. In 1913, to honor the 300th anniversary of Russia's ruling Romanov family, the first Mohammedan prayer was said in the Mosque and the solemn opening of the first Muslim temple of the Northern capital was held. That doesn't mean that the construction works had been completed by that time. The finishing works of the interior and exterior decor lasted for 7 years more and the regular public worships were started in 1920. In 1940 Soviet authorities banned services and turned the building into a medical equipment storehouse. In 1956 the Mosque was returned to the Muslim Religious Society. Nowadays the recently restored Mosque of Saint Petersburg is one of the largest in Europe — on Muslim holy days about 5,000 worshippers gather there to pray and praise Allah. The Mosque is the only functioning Moslem temple, as well as a leading educational and cultural center of Saint Petersburg.